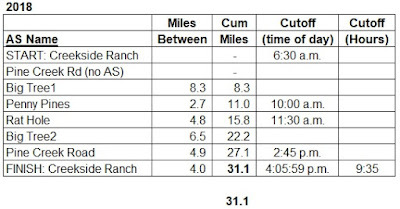 Here is the updated miles chart with miles and cutoff times. 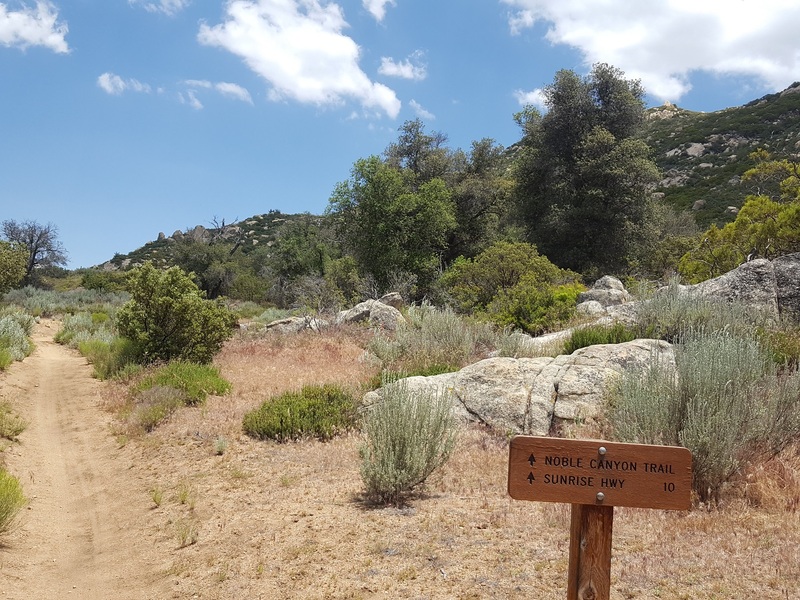 In 2019 runners will start at the Creekside Ranch (across the street from the Bible Camp) and run approx 1 mile along the asphalt road to the Noble Canyon trail-head area. Outbound you will now take the main Noble Canyon trail. You will NOT pass through the Pine Creek Road the on this first pass. Follow the Main Noble Canyon trail to the first aid station is Big Tree, followed by Penny Pines at the top. After leaving the Penny Pines aid station carefully cross Sunrise Highway then turn RIGHT onto the Pacific Crest Trail (PCT). After about 4 miles again turn RIGHT leaving the PCT and connecting with the Big Laguna trail system. This trail drops you into the Rat Hole aid station! Leave Rat Hole by crossing Sunrise Highway and continuing on the Big Laguna Trail. Follow the maps westbound to Big Laguna Lake. Now you will stay right and go around the EAST side of Big Laguna Lake. Follow the maps to the tricky left onto trail #5 which will connect you again with the main Noble Canyon trail. Head back down the main Noble Canyon trail. You'll get aid again at Big Tree aid station then the Pine Creek Road aid station. Pine Creek Road is a short 0.25 mile out-and-back. Then you'll retrace your steps back to the finish at the Creekside Ranch!